But lets focus in on the X6HRT. First off, this watch is sleek. Suunto had more than a feature-rich timepiece in mind when they designed this watch, and they've produced a very attractive product. The brushed aluminum, steel buttons, depressed mineral crystal watch face, and steel face ring all attest to both the durability and sophistication of the X6HRT; if anything, the watch's design is a strong testament to its status as a top-of-the-line watch. The reverse side of the watch is covered in a hard rubber material to protect the watch's innards against sweat during workouts. Aesthetically, its not very appealing with four screws plainly visible. But functionally speaking, visible screws means easier self-maintenence. 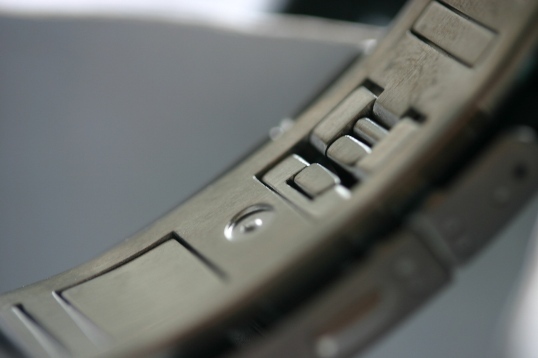 The area with the three circles and metal connectors serves as the port for syncing data from the watch to a computer. and the battery cover is plainly visible in the middle. Shown above is the backside of the X6HRT's flip lock strap connector. 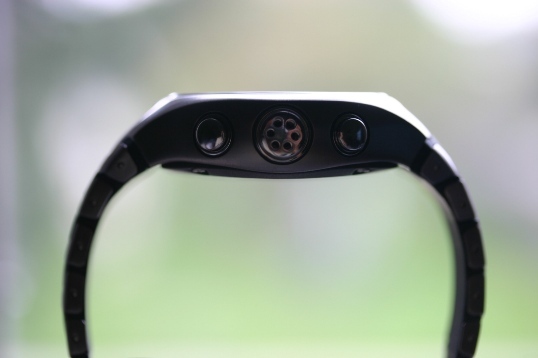 the construction of the strap connector features a lock pin that goes through two layers of metal before locking in place for maximum watch security and stability. 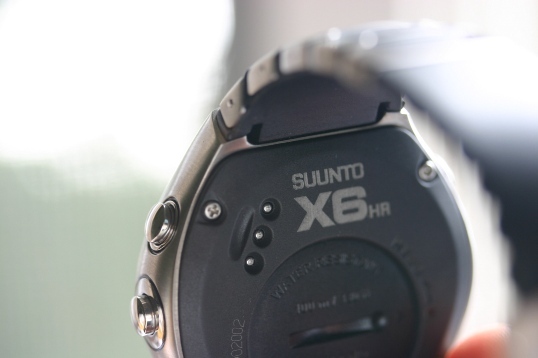 The watch is by no means thin, as this shot of its side profile shows, but 1.4 centimeters at its thickest point is more than reasonable for all the features that the X6HRT packs. 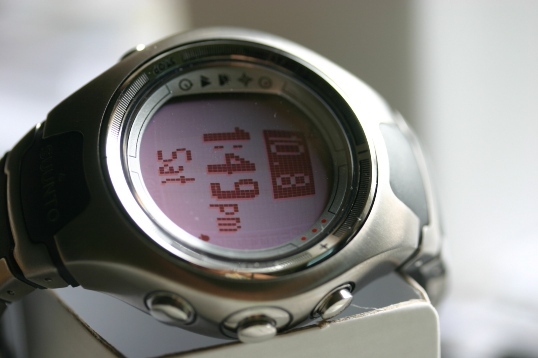 For its size, this is a watch that I wouldn't hesitate to wear casually as well as during exercise. And in case you're curious, that circular metal thing with the holes in it measures temperature and air pressure.